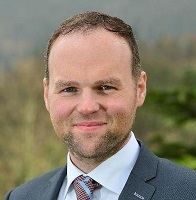 A 34-year-old ‘high flying’ 2004 Queen’s BSc Geography graduate, Connaire McGreevy, who also has a 2013 Postgraduate Diploma in Environmental Law and Sustainable Development from the University, is turning heads locally with his third major business honour in just over six months. Mr McGreevy picked up his latest accolade for Business Person of the Year at the eighth annual Aer Lingus Viscount Awards which are organised in association with Ulster Business. The Co Down entrepreneur joined over 70 leading businessmen and women for the Awards gala dinner and ceremony which took place recently (May 24) in the Institute of Directors on Pall Mall in London. Commenting on his most recent achievement, Mr McGreevy, who is the MD of CTS Projects and Mourne Mountains Brewery (and director of Warrenpoint Football Club), said: “I’m delighted to win this award, to be honoured amongst the best of NI businesses at such a prestigious ceremony is truly overwhelming. Although it’s an individual award, the business successes would simply not be possible without the hard work and dedication of the fantastic teams I have at both CTS Projects and the brewery." CTS Projects, a heating and renewable energy installation firm founded by Mr McGreevy in 2006, now employs 70 staff. The Mourne Mountains Brewery Limited, a micro-brewery producing a range of fine artisan beers, was established in January 2015. In April, Mr McGreevy picked up the Belfast Telegraph Young Business Person of the Year 2016 at a black-tie event attended by almost 500 of Northern Ireland's brightest and best in the Culloden Hotel. The Belfast Telegraph Business Awards are organised in association with British Airways. And at the UTV Business Eye Awards last year (run in association with Flybe), Connaire won the Young Business Personality of the Year. General inquiries to Gerry Power, Communications Officer, Queen’s Development and Alumni Relations Office, Queen’s University Belfast, tel: +44 (0)28 9097 5321.